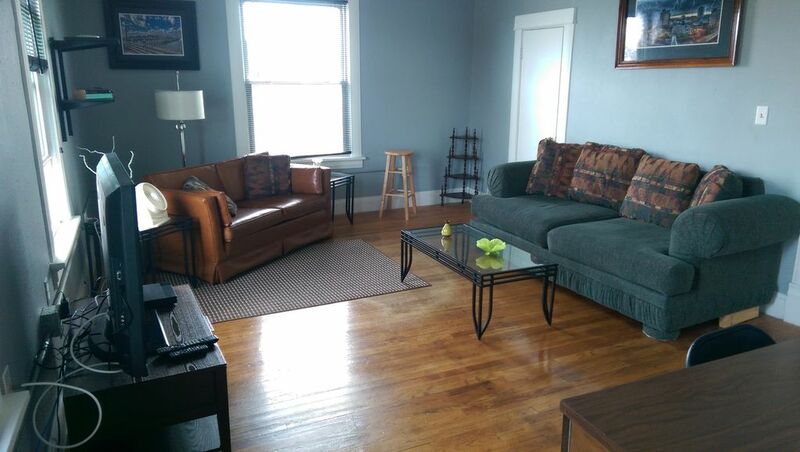 Fully furnished, 2 bed/2 bath apartment with two queens and one king size bed. Living room is furnished with large comfortable couch, 2 seat sofa, 40 inch TV with extended cable package and WiFi internet. Kitchen equipped with refrigerator, microwave, toaster, coffee maker and new electric stove. Situated just 5 blocks west of downtown Cedar Rapids, guests can stay cheaper than a hotel room with a lot more space for work or any other reason you may be staying in Cedar Rapids. Married father of 3 kids. We have a client that uses this unit periodically and decided to make it available to anyone else who needs a roomier place to stay while in town. Most room by a long shot for a cheaper price than local hotels. toilet, shower, 3rd floor bathroom with tiled shower, sink and toilet. toilet, tub, 2nd floor 3/4 bathroom with toilet, 4 foot tub and sink. Off street free parking in adjacent lot. Fiber backed WiFi Network in unit. Living/TV Room with extended cable and WiFi DVD player. Sink, refrigerator, freezer, toaster oven, microwave, electric oven and stove. Extended cable package with room. Local ImOn cable provider service. WiFi enabled DVD player with Netflix and Amazon applications. Kids toys available upon request. Small DVD movie library in unit. Mark was a wonderful host. He sent all the information we needed for the places we stayed in, everything was comfortable and clean, and was really homey. We have a group of 5 total stay here, 2 couples and a single and it was perfect! Everyone loved the place. Quiet, you could have your own privacy if you wanted but there was a huge kitchen and living room to hang out in. The pictures really don't do the space justice. I personally loved the lower bathroom shower. Easy parking right in the lot behind the house and right in the heart of CR. If you're looking for the perfect place to stay for a night out, this is it. Mark the host was always responsive if we needed something. Thanks Mark! We will be back!!! Perfect setting for our group. Very clean and spacious. It was conveniently located close to downtown. We cant wait to come back. We had a great stay, thanks Mark! Very spacious rental, easy to find and very clean. We had a great stay, very spacious, clean, easy parking and easy to find! Thanks Mark! Highly recommended! PLACE WAS GREAT , LOCATED NEAR EVERYTHING. PEOPLE FRIENDLY AND ACCOMMODATING. HAD A GREAT TIME. 5 STARS!!! Very Clean, Lots of Room. Stayed for two nights. Easy access, everything very clean and very roomy space. Enjoyed our stay.